At its meetings of 7 February and 17 April 2018, the Board established the remuneration policy applicable to Xavier Huillard in his capacity as Chairman and Chief Executive Officer for the period 2018–2022, acting on a proposal from the Remuneration Committee. At its meeting of 5 February 2019, the Board modified this policy. Each of these components is explained below. 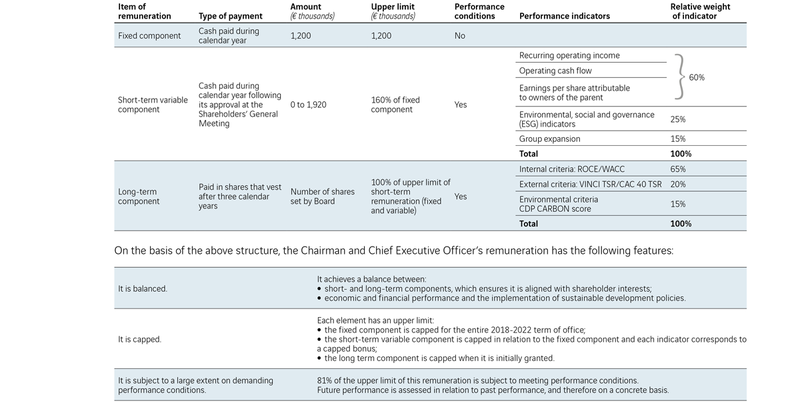 The breakdown of the Chairman and Chief Executive Officer’s actual remuneration depends on the extent to which the performance conditions governing the amount of the variable components are met. - introduce an environmental indicator among the performance conditions applicable to his long-term remuneration. At the request of the Remuneration Committee, a benchmarking exercise relating to the components of Mr Huillard’s remuneration package is conducted by an independent firm and updated on a regular basis. The aim of this exercise is to ensure that the remuneration of the Group’s top executive remains coherent and in line with the market. To this end, the Committee has selected two representative peer groups, the first comprised of 17 French industrial companies that are members of the CAC 40 (the “CAC 40 peer group”), and the second comprised of 10 European companies operating in comparable markets (the “International peer group”). below the third quartile of both peer groups. 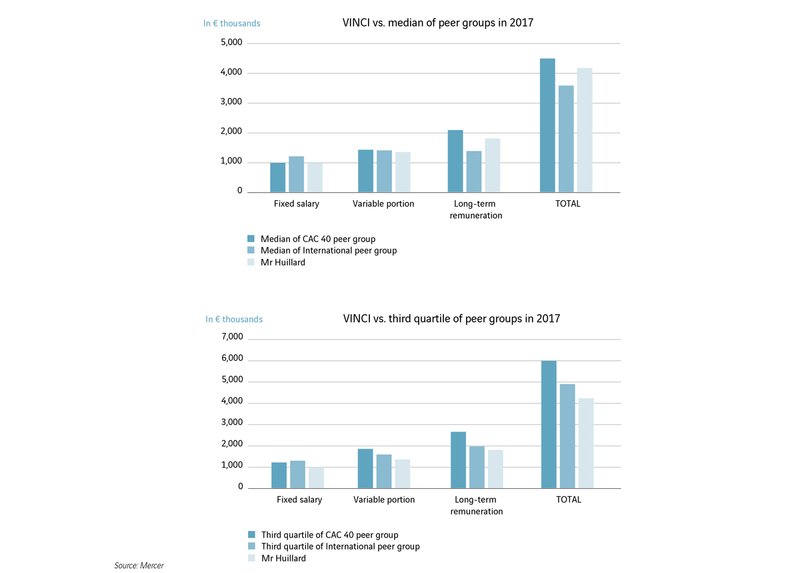 The charts below compare the actual total remuneration paid to VINCI’s Chairman and Chief Executive Officer in 2017 with that of senior executives in the peer groups, plotted relative to Ebitda and market capitalisation at 31 December 2017. The short-term fixed component of Mr Huillard’s remuneration was set at €1,200,000 per year for the duration of his term of office, thus over the period 2018–2022. This component is paid in cash, in 12 monthly instalments. 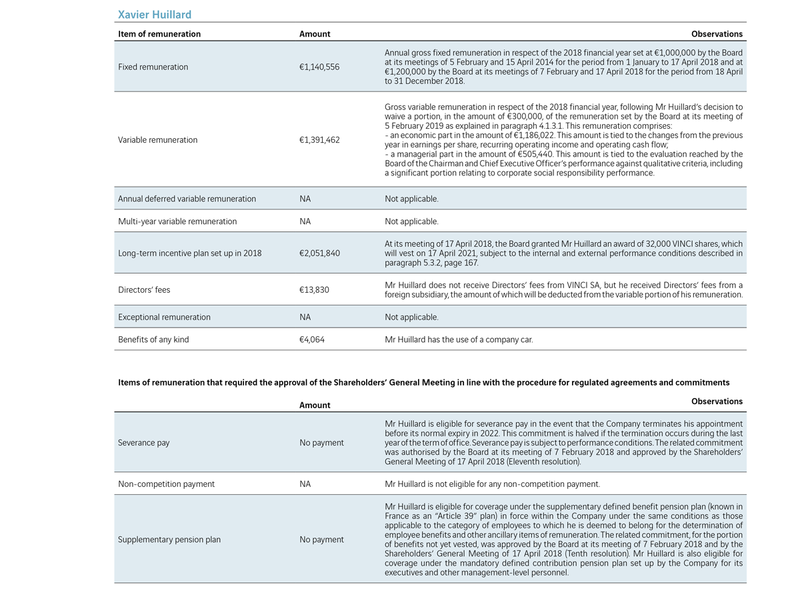 The short-term variable component of Mr Huillard’s remuneration is an amount paid in cash, which is determined by the Board when approving the financial statements for the previous year. It has a lower limit of €0 and an upper limit of €1,920,000, which corresponds to 160% of the fixed component. To calculate this component, the Board follows a methodology that involves economic and financial criteria as well as non-economic criteria. This approach was defined by the Board in February 2018 and then modified in February 2019 to better take into account -environmental, social and governance (ESG) factors, using both quantitative and qualitative indicators. The chart below illustrates the impact of these modifications. The method adopted by the Board to set the amount of the short-term variable component involves examining the above indicators and comparing them with those of the previous year in order to determine an appropriate bonus for each of them. All of these bonus amounts are subject to upper limits. Each of these indicators is associated with a bonus, the amount of which depends on the movement in this indicator during the financial year in question and compared with the previous year. This amount is calculated by linear interpolation between two limits: €0 for a negative change of 10% and €384,000 for a positive change of at least 10%. The upper limit of the bonus was reduced in 2019 due to the readjustment of the short-term variable component in favour of ESG criteria. However, the Board reserves the right to amend these rules in order to cover exceptional situations. The economic part accounts for a maximum of 60% of the upper limit for short-term variable remuneration (i.e. a total amount of €1,152,000 in relation to the overall ceiling of €1,920,000 for short-term variable remuneration). - at the end of the year, the Remuneration Committee and the Appointments and Corporate Governance Committee meet, first separately and then together, to assess the level of performance achieved for each indicator, with reference to factual elements. Their assessment is shared with all of the Board members, with the exception of the executive company officer. The Board then determines the percentage corresponding to the performance for each goal. This allows the Board to set the amount of the qualitative part. The Board reserves the option to change the indicators used depending on the environment and the context. The short-term variable component is equal to the sum of these bonus amounts. La rémunération du président-directeur général comporte également une partie long terme destinée à aligner les intérêts du bénéficiaire sur ceux des actionnaires dans une perspective pluriannuelle. The Chairman and Chief Executive Officer’s remuneration also includes a long-term portion intended to align the interests of the top executive with those of the shareholders, taking a multi-year perspective. To this end, the Board carries out an analysis each year to determine the appropriate structure of the award for this component. It may be comprised of physical or synthetic VINCI shares and may be granted either under a plan set up in accordance with ordinary law or under any other plan permitted by law. In practice, the awards thus far have consisted of VINCI shares and have been granted in accordance with ordinary law. It should be noted that, under current French law, VINCI’s executive company officers are not eligible to receive performance share awards as provided for in Article L.225-197-1 of the French Commercial Code, due to the criteria laid down by Article L.225-197-6 of that Code. When the award is granted, the Board decides on the maximum number of shares that will vest at the end of a three-year period, provided that the Chairman and Chief Executive Officer remains with the Group and that certain performance conditions are met. The fair value of these annual awards may not exceed 100% of the limit for the Chairman and Chief Executive Officer’s short-term remuneration (fixed and variable components), i.e. €3,120,000, with the number of shares determined accordingly. The Board reserves the right to maintain eligibility in other cases, depending on its assessment of the circumstances. The vesting of the award is also subject to performance conditions, which may decrease the number of shares delivered and even -eliminate the award entirely. The trend in VINCI’s CDP Carbon scores since 2010 is shown in the chart below. It should be noted that the score achieved each year measures performance against the increasingly stringent requirements set by the CDP. Mr Huillard is eligible to participate in the defined contribution pension plans and insurance plans set up by VINCI for its employees. In order to ensure clarity in this regard, the Board decided to formally confirm his senior executive status. He is also eligible to participate in the supplementary defined benefit pension plan (known in France as an “Article 39” plan) set up in 2010 by VINCI for senior executives of VINCI SA and VINCI Management, described in paragraph 4.1.7, page 163. 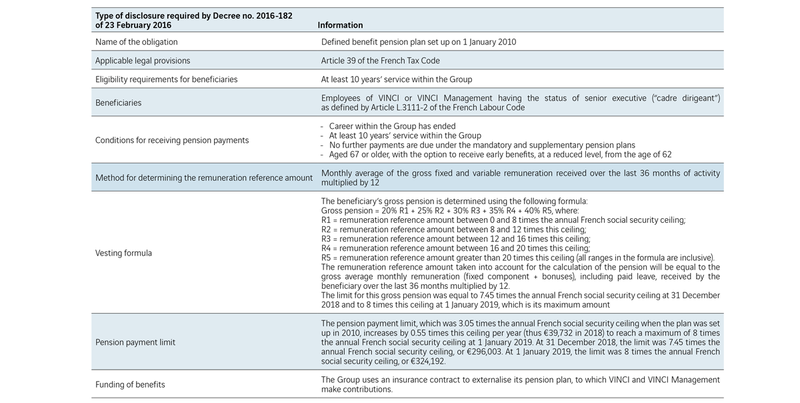 At its meeting of 5 February 2019, the Board noted that the performance condition set for the increase in the payment limit for benefits had been met and that Mr Huillard is thus eligible from 1 January 2019 to participate in the supplementary defined benefit pension plan entitling him to a pension capped at 8 times the annual French social security ceiling, i.e. the amount of €324,192 at 1 January 2019. It should be noted that the benefits under these plans were taken into account in determining Mr Huillard’s overall remuneration. The Shareholders’ General Meeting of 17 April 2018 approved, in its Eleventh resolution, a commitment to provide Mr Huillard with severance pay in the event that the Board simultaneously terminates both of his appointments as Chairman of the Board and Chief Executive Officer prior to the normal expiry of his term of office as Director, except in the case of gross negligence or retirement. This commitment is limited to 24 months of his remuneration, in line with the recommendations of the Afep-Medef code. The amount of severance pay would be determined by the Board with regard to the Group’s economic performance, measured by applying the same indicators as those used for the calculation of the economic part of his variable remuneration (earnings per share, recurring operating income, operating cash flow). Severance pay could reach the equivalent of 24 months of his remuneration if the average rate of achievement of the quantitative targets used to calculate the variable part of his remuneration over the two years preceding the termination of his appointments were above 100% of the objective and nil if the average rate were less than or equal to 85% of the objective. Between these two limits, the amount of severance pay would be determined by linear interpolation. The amount of severance pay would be halved if the termination occurs during the fourth year of Mr Huillard’s term of office. Mr Huillard has the use of a company car. Approval of the principles and guidelines used to determine and structure the fixed, variable and exceptional components of the total remuneration and benefits of any kind payable to the Chairman and Chief Executive Officer. The Shareholders’ General Meeting, acting in accordance with Article L. 225-37-2 of the French Commercial Code, having reviewed the Report of the Board of Directors and in particular the Report on corporate governance included therein, hereby approves the principles and guidelines used to determine and structure the fixed, variable and exceptional components of the total remuneration and benefits of any kind payable to the Chairman and Chief Executive Officer, as detailed in the report required by the final paragraph of Article L.225-37 of this same Code and provided on page 159 of the 2018 registration document. The Board noted the challenging nature of the economic objectives set, since although the Company delivered outstanding perform-ance in 2018, the economic part of the 2018 bonus corresponds to only 93% of the maximum amount. With respect to the qualitative part of the variable component of Mr Huillard’s remuneration for 2018, the Board had decided to take into account the Group’s expansion over the medium term, duty of vigilance and compliance, health and safety in the workplace, and the quality of corporate governance. At its meeting of 5 February 2019, the Board concluded that it was appropriate to award him 78% of the maximum amount, in light of his managerial performance in 2018. In reaching this determination, the Board noted in particular the quality of the external growth transactions carried out in 2018, especially in the airport sector, as well as by VINCI Energies and Eurovia; the Group’s responsiveness in proposing and implementing governance methods appropriate to circumstances; and the resources deployed for duty of vigilance and prevention programmes. Noting that the workplace accident prevention policy rolled out in the different Group entities is bringing results, with declines in both frequency and severity rates, the Board calls on the Executive Management to maintain and intensify the Group’s efforts in this area. The Board therefore decided to set the amount of Mr Huillard’s short-term variable remuneration at €1,691,462, before deducting Directors’ fees received in 2018 (€13,830 net). However, at its meeting of 5 February 2019, Mr Huillard informed the Board of his wish that the short-term variable component of his remuneration for financial year 2018 should remain at a level similar to that of financial year 2017. He thus proposed to the Board that the variable component of his remuneration be reduced by €300,000, and requested that this amount be paid by VINCI to the Fondation VINCI pour la Cité; the Board accepted this proposal. At its meeting of 7 February 2018, the Board noted that the performance conditions under the long-term incentive plan set up on 14 April 2015 had been met (see paragraph 5.4.1, page 167). Accordingly, the Board decided that all of the 23,240 shares initially included in the award granted to Mr Huillard would vest at 14 April 2018. At its meeting of 5 February 2019, the Board noted that the performance conditions under the long-term incentive plan set up on 19 April 2016 had been met at 97.27% (see paragraph 5.4.1, page 168). Accordingly, the Board decided that 25,290 of the 26,000 shares initially included in the award granted to Mr Huillard would vest at 19 April 2019. It should be noted that the vesting of this award was subject to the same performance conditions as those applying to grants of share awards under the performance share plans set up by the Company for the Group’s employees, which are described in paragraph 5.3.2, page 167. Furthermore, at its meeting of 17 April 2018, the Board decided to grant a conditional award to Mr Huillard, corresponding to a maximum of 32,000 VINCI shares. At that time, the fair value of this award was €2,051,840. All or some of the shares in question will vest at the end of a three-year period on 17 April 2021, provided that Mr Huillard remains with the Group and subject to the fulfilment of performance conditions that will be evaluated at 31 December 2020 as described in paragraph 5.3.2, page 167. The Board had noted that Mr Huillard met all eligibility requirements at 1 January 2018 to claim his pension under the defined benefit plan set up in March 2010 by the Company for its senior executives, namely having reached the legal retirement age, having completed at least 10 years’ service as specified by the plan and having ended his professional career within the Group as stipulated by the Board in March 2010 for company officers not holding employment contracts. The Board had also noted that the pension benefits Mr Huillard would be entitled to receive at 1 January 2018 were subject to a payment limit equal to 7.45 times the annual French social security ceiling. The renewal of Mr Huillard’s term of office did not affect the amount of his pension benefits, due to the existence of this payment limit, except for the fact that by deferring his claim to this pension, Mr Huillard could benefit in future from the payment limit equal to 8 times the annual French social security ceiling (instead of 7.45 times this ceiling), which enters into effect on 1 January 2019. Given that the increase in this limit (equivalent to 0.55 times the annual French social security ceiling, or €22,288 in 2019) occurred during Mr Huillard’s term of office, the Board had decided to make the benefit of this increase subject to a performance condition. The performance condition selected by the Board and approved by the Shareholders’ General Meeting of 17 April 2018 (Tenth resolution) was based on the ratio of the return on capital employed (ROCE) to the weighted average cost of capital (WACC), as noted by the Board at 31 December 2018. Both the numerator and the denominator of this ratio were calculated as an average over the same three years (2016, 2017 and 2018). This ratio needed to be equal to or greater than 1.10 in order for the increase in the payment limit to vest at 100%. At its meeting of 5 February 2019, the Board noted that the performance condition had been met. At the Shareholders’ General Meeting of 17 April 2019, in accordance with Article L.225-100 of the French Commercial Code, shareholders will be asked to vote on a draft resolution relating to the items of remuneration due or granted in respect of the 2018 financial year to Mr Huillard, Chairman and Chief Executive Officer. In his capacity as Vice-Chairman and Director, Yves-Thibault de Silguy receives specific Directors’ fees calculated as described in paragraph below. In addition, on 5 February 2014 the Company had entered into a services agreement with YTSeuropaconsultants, of which Mr de Silguy is sole shareholder. This agreement was authorised by the Board and approved by the Shareholders’ General Meeting of 15 April 2014 (Twelfth resolution). When the renewal of Mr de Silguy’s term of office as Director was approved by the Shareholders’ General Meeting of 17 April 2018, the Company entered into a new services agreement with YTSeuropaconsultants, under the same terms as the previous one. As it was also approved by the Shareholders’ General Meeting of 17 April 2018, the condition precedent specified in this agreement signed on 7 February 2018 had been met and it thus came into effect at the close of the Meeting. However, it was brought to the Company’s attention by BNP Paribas Securities Services in July 2018 that an error had been made at the Meeting in determining the exercisable voting rights. The Board was thus required to declare this agreement as null and void retroactively to 17 April 2018. This situation required Mr de Silguy to return to the Company the amounts he had received under the new agreement, which had become null and void. Lastly, it should be noted that Mr de Silguy has received a pension paid by the Company since 30 April 2010. VINCI’s commitment under this pension totalled €7,576,525 at 31 December 2018. Mr de Silguy also has the use of a company car. The Shareholders’ General Meeting of 20 April 2017 had set the aggregate amount of Directors’ fees at €1,400,000 for each financial year, starting on 1 January 2017. A resolution will be put to the Shareholders’ General Meeting of 17 April 2019 to raise this aggregate amount to €1,600,000. This increase is justified due to the introduction of rules to give greater weight to variable fees (which are based on physical attendance at meetings of the Board and its committees as well as the number of meetings held), the appointment of an additional Director to be put to a vote at this same Meeting, together with the fact that Miloud Hakimi, who had waived his Director’s fees until 17 April 2018, requested that they be paid from this date to the CFDT. - n additional amount of €1,000 is paid per Board or committee meeting for Directors residing in an EU country other than France and €2,000 for Directors residing outside the EU, provided that they physically attend these meetings. At its meeting of 17 October 2018, having decided to separate the roles of Vice-Chairman and Lead Director, the Board accordingly determined an allocation for the special Director’s fee in the amount of €100,000 previously paid to the Vice-Chairman and Lead Director, dividing it into payments of €70,000 for the Vice-Chairman and €30,000 for the Lead Director. Le Conseil ayant décidé, au cours de sa réunion du 17 octobre 2018 de scinder les fonctions de vice-président et d’administrateur référent a, en conséquence, décidé de répartir le jeton spécial de 100 000 euros précédemment versé au vice-président administrateur référent à hauteur de 70 000 euros pour le vice-président et de 30 000 euros pour l’administrateur référent. The total amount of Directors’ fees paid in 2018 by the Company (for the second half of 2017 and the first half of 2018) amounted to €1,233,750. 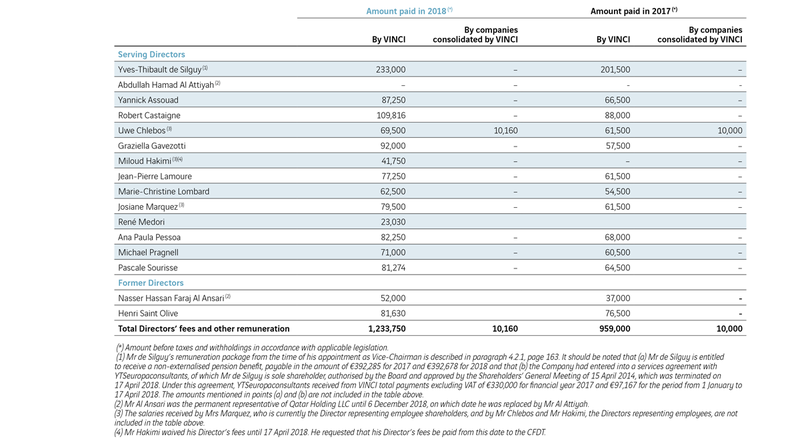 Some company officers also received Directors’ fees in 2018 from companies controlled by VINCI. The total amount of Directors’ fees payable by VINCI in respect of 2018 was €1,214,584. 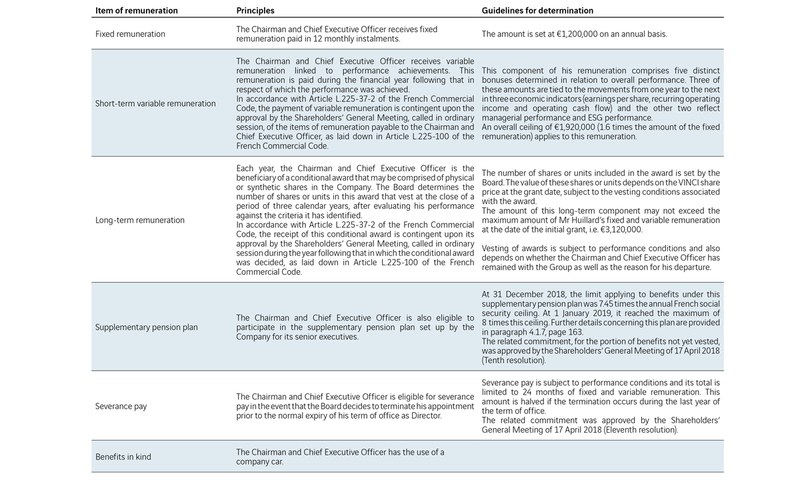 The table below summarises the Directors’ fees and other remuneration paid in 2017 and 2018 to non-executive company officers of VINCI. In accordance with the Company’s Articles of Association, each Director (other than the Director representing employee shareholders and the Directors representing employees) must hold a minimum of 1,000 VINCI shares which, on the basis of the share price at 31 December 2018 (€72.02), amounts to a minimum of €72,020 invested in VINCI shares. The number of shares held by each of the company officers, as declared to the Company, is included in the information presented in paragraph 3.2, pages 138 to 144.